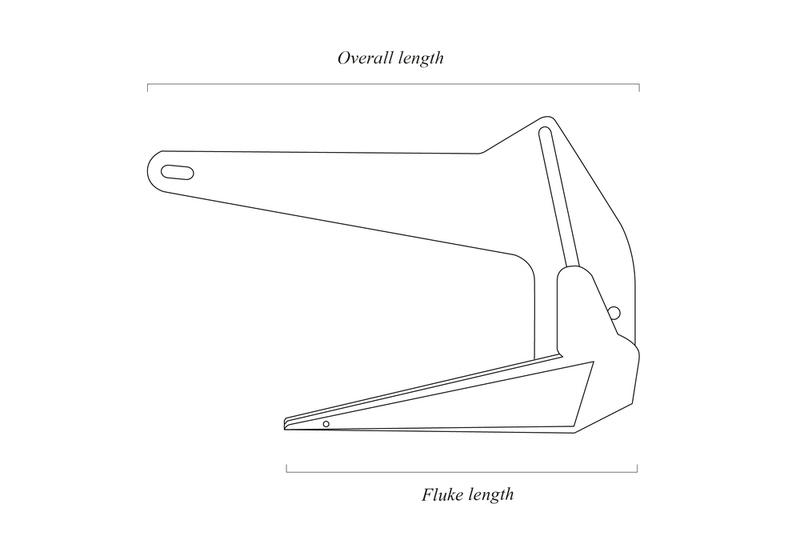 We stock anchors in a range of sizes to suit your vessel. We stock anchors down to 6.5kg size for vessels smaller than 20ft. We also manufacture stock in 18kg and 27kg size. If your vessel is over 40 foot or expected to carry heavy loads (above 10 tonnes) then please contact us about these models. Is my anchor heavy enough? As seen from the table and charts comparing anchor performance, the holding force to weight ratios of modern anchors can be many times those of older designs such as the Bruce, CQR and Delta. Therefore do not be surprised if your recommended Knox anchor is lighter than the anchor it is replacing. If you are replacing your current anchor with a high performance Knox anchor, you have the choice of using a lighter anchor of similar holding power or keeping to the previous weight and gaining much greater holding power. This Knox anchor size recommendations here are suitable for use in winds up to force 8 when there are moderate non-breaking waves. For more severe conditions choose a heavier Knox Anchor. All our products are available to order here online. Knox anchors are shipped by courier service from the UK to destinations around the world. ** Belgium, Denmark, Finland, France, Italy, Germany, Ireland, Luxembourg, Netherlands, Norway, Portugal, Spain, Sweden, Switzerland. Wherever you store your anchor onboard, it's important that you know it will fit. 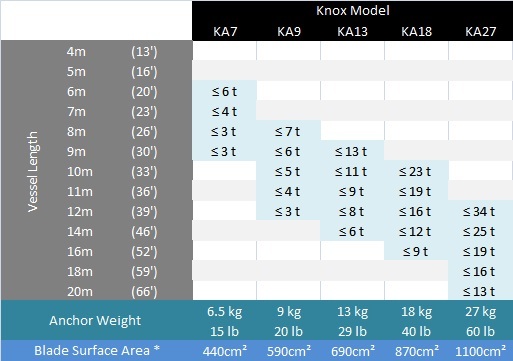 The dimensions of our range of Knox Anchors are shown in the scale drawings and the table below to help you. 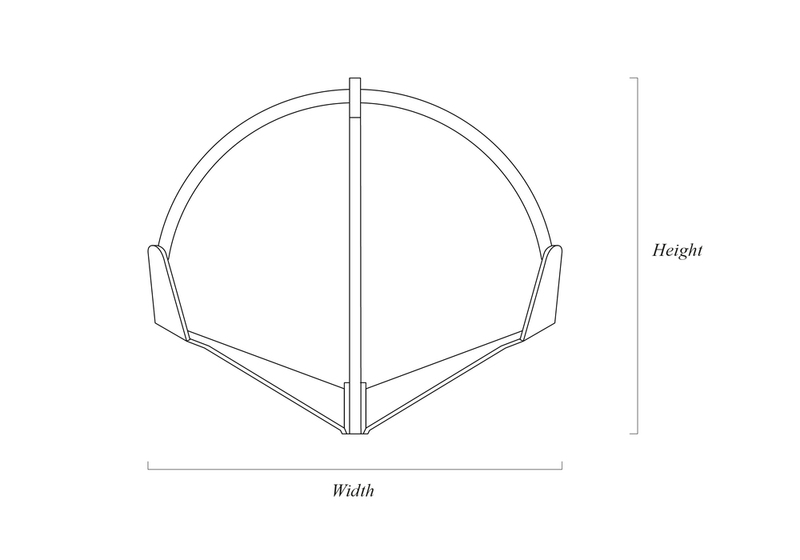 In addition, we can send you a paper template of the profile of any size anchor by post. You can trace onto cardboard and check the fit in whatever location you wish to stow it. Our policy is that if you have made reasonable attempts to ensure a fit by checking dimensions before hand, and your new Knox Anchor doesn't fit, we'll refund your purchase price on the return of the anchor in un-used condition.